This side bar contains links to the short histories of the various organisations that exist (or use to exist) within Strathmore. Some of the histories have been summarised in main text. (# signifies links to another web site). The story of Strathmore, as with other suburbs, is not solely about the settlement and development of physical infrastructure. It is about residents acting together to assist themselves and others in the suburb, and in the process forming a community. Throughout the history of the suburb and its organisations there are numerous examples of men and women putting in tireless effort, for fundraising (the cakestalls, raffles and fetes too numerous to mention), organising and lobbying on behalf of the suburb. Most of these people remain nameless, never expecting any thanks or recognition. The area now known as Strathmore was once traversed and occupied by the Aboriginal People of the Wurundjeri willam People#. The Wurundjeri willam People consisted of several bands, each with a number of extended families. The People that traversed the Strathmore area were a sub section of the band called the Kurnaje berreing. They occupied land extending from the present Central Business District along the east side of the Maribyrnong River through to Mount William (about 15 kilometres North West of Kilmore). The Aboriginal peoples were subsequently displaced by the Europeans who colonised the area, however there are accounts from early settlers of witnessing Aboriginal corroborees as the nomadic people moved through the area. There are reports of one particularly large corroboree which occurred between Lincoln Road and Mt Alexander Road in 1868. Two bands of Aborigines met and a corroboree by bonfire occurred that night witnessed by many of the local European settlers. The Port Phillip area was settled in 1835#, mainly by settlers sailing across Bass Strait from Van Diemen's Land (Tasmania). The first land sales in the area of Strathmore were made in 1843 and 1845. The 1843 sale was of Section 23 of the Parish of Doutta Galla which covered most of Strathmore North area and some of Essendon Airport. The 1845 sale was of Section 15 of the Parish of Doutta Galla which is most of remaining southern part of Strathmore. There are interesting parallels and differences between the two first purchasers or the Crown Grantees as they were known. Both Crown Grantees were land speculators - they purchased the land in Strathmore area and then either sold it on directly or subdivided it and sold it shortly after purchasing it. In both cases they made large profits on their investment. They were also both involved with law enforcement and the judiciary. However there the similarity ends. Major Frederick Berkley St John, the purchaser of the Strathmore North area, (Section 23), had been appointed as a police magistrate for the Port Phillip area, a licensing magistrate and Commissioner of Crown Land for the County of Bourke. He did not however serve in these positions with distinction. He became notorious for petty corruption, regularly soliciting and accepting bribes from those appearing before him or seeking a favourable ruling from him. Eventually his misdemeanours caught up with him and after a court case was forced to resign from his official positions and leave the colony. (Read More about St John). Edward Jones Brewster was the Crown Grantee of Section 15, Parish of Doutta Galla in the Strathmore area. He had a background of legal training in Dublin and soon after arrival in Melbourne he was appointed Chairman of Quarter Sessions and Commissioner of the Court of Requests. He was one of Port Phillip District’s first Judicial Officers. During his career he was elected to the Colonies Legislative Council, supporting the Port Phillip areas separation from the colony of New South Wales. He had the honour of laying the first stone of the first bridge across the Yarra. After making a considerable fortune from land speculation, in 1853 he was ordained as a clergyman of the Church of England and remained a clergyman for 40 years. 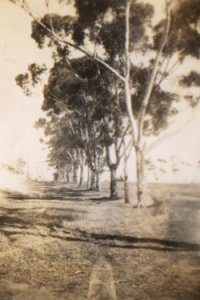 In 1845 (the same year as the initial purchase) Brewster subdivided and sold 100 acres of land running along Woodland Street, from Carnarvon Road to Moonee Ponds Creek, to Thomas Napier. Thomas Napier and his descendants were to occupy that land into the 1920s and beyond, and left a lasting legacy to Strathmore. Thomas Napier was born in Scotland 1802 emigrating to the Colonies in 1832 firstly to Van Diemen’s Land and then later to Port Phillip District. He was a builder and continued that trade in the colonies. He moved to Melbourne in 1837 less than two years after the first permanent settlement of the Port Phillip area. He purchased a half acre of land in Collins Street in the centre of Melbourne and built a house for himself and his new wife Jessie Patterson. The land cost him 20 pounds. In 1845 he moved out to the Strathmore area building a house on the top of the hill in Woodland Street, in the area now occupied by the Catholic Church and School. He called that house “Rosebank”. 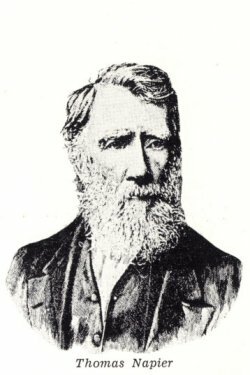 Thomas Napier was made a Justice of the Peace in 1860, and he had the honour of laying the Foundation Stone of the now demolished Pascoe Vale National School that was located adjacent to Moonee Ponds Creek where Five Mile Creek enters. When he died in 1881, his property divided between his wife, Jessie, and his son Theodore. Jessie died in 1891 and her property was left to her daughter Eleanor and son in -law, George Page Barber. It was around this time that the original Rosebank house was damaged by fire and the present large two storey house known as Rosebank built. Thomas’s son, Theodore is well known for a number of reasons. Firstly he was well known for his love of his father’s place of birth Scotland and had the habit of wearing a Scottish kilt around his property and elsewhere in the district. His legacy to Strathmore was his donation in 1920 of 10 acres of native bushland to Essendon Council for parkland. This land is now called Napier Park. The deed of Gift required that the land remain as native bushland and consequently the park is an excellent indication of what the land in Strathmore was like prior to European settlement. Theodore Napier built a house known as “Magdala” on Carnarvon Road. This house also burnt down. The other early resident of note was John Murray Peck. In 1881 Peck purchased land near present day Wendora Street and built the house he called Lebanon (named after his birthplace in the USA). Peck was notable for being one of the co -founders of the Cobb and Co.# Stage Coach Company although he sold out of this business after a couple of years. He subsequently became a Stock agent. He took an active interest in local affairs was a Councillor and later Mayor for the Borough of Essendon and Flemington and was vice president of the Essendon Football Club. Lebanon House is the oldest house in Strathmore and is privately owned. It is a lovely white two storey house with verandahs and cast iron lace work. Unfortunately it is completely built around and barely visible from the surrounding streets. (Read More about Peck and Lebanon House). John Peck was also responsible for the construction of "Wannaeue" house in the 1870s (formerly located at the bottom of Peck Avenue but now demolished). His son, Harry Peck was also responsible for the for the construction of another of the older houses in Strathmore, "Hiawatha" which was constructed circa 1891. The above early residents achieved notoriety through their wealth and position in the society of the early colony. However the history of the early Strathmore area is also the story of the many other early settlers and farmers, who purchased or leased land in the area, cleared the bush, erected fencing and houses. In this early period of suburb the majority of the residents made their living off the land by farming. During the period from the 1840s to the 1930s and into the 1950s for the northern areas of the suburb, most of the Strathmore area was typical Australian country farming land, with gently undulating hills which dropped down the valley to Moonee Ponds Creek. The land would have been dotted with single trees or clumps of trees, with timber post and rail fences (later replaced with wire), dirt roads and cattle or sheep grazing in the paddocks. There may also have been some cropping and hay growing. The early “suburban” residents can recall a goat farm and an operating dairy. Barrett’s dairy, located off Loeman Street (near Term Street), was still operating into the late 1940s. The dairy grazed cattle on the land now occupied by housing and the Strathmore Community Hall, Tennis Courts and Bowls Club while new houses sprung up across the street. Click Here to read Ray Gibb’s History of the Farms. 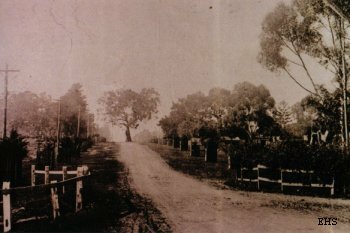 Some parts of the section between Carnarvon Road and Bulla Road were originally subdivided in the earlier Melbourne boom times of the 1880s however the estate did not sell and the land subsequently continued to be used for farming. In 1886, 38 township and villa sites with frontages to Pascoe Vale Road, Brisbane St., Loch Cres. and Kilburn St. were offered for sale. They were offered for sale by Essendon auctioneers Buzzard and Co. under the name "Byron Vale Estate" (named after the poet). The land was sold as being part of Pascoe Vale Township, which had the attraction of having the newly constructed Pascoe Vale Railway Station. For the auction day, the auctioneers promised to provide a special train to the site, a marquee, light refreshments and "a cup of tea for the ladies". The auction was highly successful for the vendors, with the land which had been originally purchased for about 30 pounds per acre selling for prices up to 325 pounds an acre. The 1920's was another boom time for land speculation with vast areas being bought and subdivided. However due to the Depression of the 1930's and the Second World War, it was a long time before some of these housing lots were sold and housing developed. One of the first areas of Strathmore to be subdivided for residential housing in this second wave of subdivision was Rosebank Estate which consisted of the block bounded by Upland Road, The Crossway, Woodland St. and Pascoe Avenue. This was subdivided in 1920. The land was part of the original Napier farm and was offered for sale by Dr. N.C. Barber (the son of G. P. Barber). The area from The Crossway to Napier Street was subdivided in 1927. Click Here to read more about the Early Subdivisions. In 1921 two important events occurred. Firstly the Broadmeadows railway line was electrified which was an important factor in encouraging residential development. Secondly the Government purchased land for Essendon Airport effecting the extent of growth of the suburb and later noise complaints. In 1923 the Catholic Columban Society# purchased two of the large early houses in Strathmore, North Park Mansion and Rosebank House. When purchased North Park was intended to be a seminary for Columban priests and Rosebank was intended to be a Preparatory Novitiate for Columban nuns. 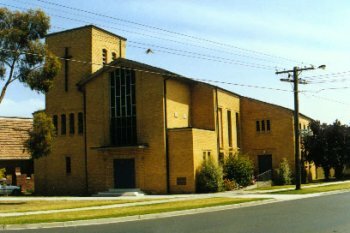 Subsequently in 1941 St Vincent's Catholic Parish was established and a new church and school constructed adjacent to the Rosebank House. In 1961 Rosebank became a convent for the Sisters of Charity. 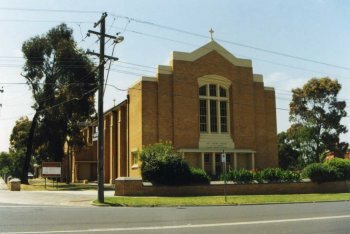 St Vincent's Parish built the new church building in 1959. (More). The 30s, 40s and 50s were important decades for the suburb. The number of houses was growing significantly with predominantly new families moving into the suburb. It was recognised by the residents that infrastructure would be required including schools, churches, sporting and social facilities. In many instances this meant the forming of committees and boards to organise, raise funds and to lobby on behalf of the suburb and its residents. However suburbs do not always develop the way that the residents think is desirable. In 1933 the Craigieburn Coursing Club established Napier Park Coursing Track for the racing of greyhounds. The Track was on the flats adjacent to Moonee Ponds Creek#, the site of the current Strathmore Secondary College. The construction of the track was opposed by residents. Also in the general area, on the flats of the Moonee Ponds Creek closer to the end of Woodland Street, a Racing Cycle track was opened in 1939 by the "Board Track Cycling Company". (Read more about Racing in Strathmore). The Presbyterian new church building was opened in 1962. (Photograph). 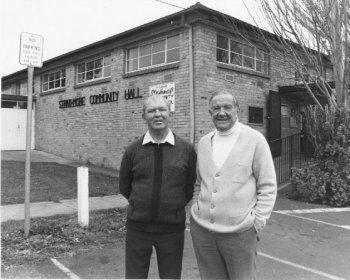 To facilitate the construction of sporting and social facilities the Strathmore Community Association (SCA) was established by Broadmeadows Council in 1949. The SCA was responsible as the umbrella organization for the establishment of the Community Hall, Bowling Club, Tennis Club, Kindergarten, and Baby Health Centre located at the corner of Napier and Loeman Sts. (More about the SCA). By the mid 1950s the area of Strathmore North was beginning to develop with residential housing and the need for a local school was recognised. Again residents committees were formed to lobby the Education Department. The committee and residents achieved their goal when Strathmore North Primary School opened in 1961. Construction of the Tullamarine Freeway# through Strathmore commenced in 1967/68. (Aerial Photo.) Hood Street and part of First Avenue was demolished to make way for the freeway. Approximately 70 homes were demolished and the residents moved. At the time there were complaints that the Freeway was a "Berlin Wall" dividing the suburb into two sections. The effect was completed in 1998 when the CityLink# Construction Authority, a private company widening the freeway and converting it to a tollway, constructed very high concrete walls along the freeway as noise barriers. The moves for the separation of Strathmore from Broadmeadows finally succeeded in 1979 when the Annexation of Strathmore from Broadmeadows to Essendon Council occurred. Further change in the Local Government occurred when the State Government policy of Council amalgamations was implemented in 1994 and the City of Moonee Valley was formed, incorporating Strathmore. Other events of significance to Strathmore can be found in the Organisation Histories and the Histories of Houses and Other Places which are accessed through the links on sidebar to this page. A summary of the history is contained in the Timeline page. More details of the early History of Strathmore and nearby areas is contained in Ray Gibb's "Annals of Strathmore and the Surrounding Areas" and his Other History Pages. Some of the sources utilised for this short history are listed on the "History Sources" Page.